Robinson Helicopter, Torrance: See how they make helicopters on this tour, which is given a couple of times a month. Children under 12 are not allowed, and all visitors must wear closed-toe shoes. ChocXO Chocolate Factory, Irvine: You can follow a lowly cacao bean on its journey to becoming a delicious chocolate bar in this factory tour. Reservations are essential. Mast Brothers Chocolate Factory, Los Angeles: You can go behind the scenes of chocolate-making at this factory, too. Sriracha Factory: Fans of the spicy sauce, go straight to Irwindale where you can take a 45-minute tour of the Huy Fong Foods factory in Irwindale (west of Pasadena) where it's made. Tours are given several days a week. Anchor Brewing Company: The Anchor Steam Beer Brewery offers two tours a day, with beer tasting afterward. Children can go on the tour, but you must be at least 21 years old to sample their products. An appointment is required. Anheuser-Busch Brewing Company: Busch's Fairfield brewery offers tours daily, except major holidays. They will show you how their beer is made and also how they're harnessing the sun and the wind to power the operation. Boudin Sourdough Bread Bakery: The well-known sourdough bread maker offers self-guided tours at their Fisherman's Wharf location. You can't go into the demonstration bakery, but you can watch through a large glass window. 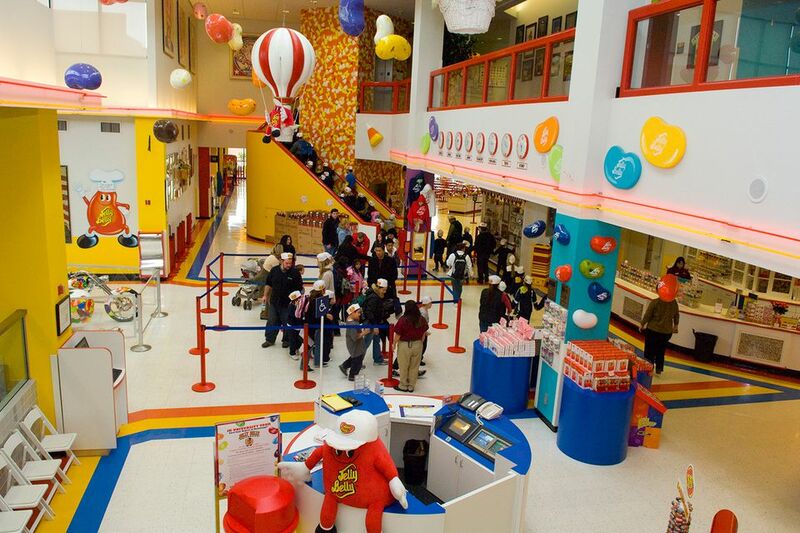 Jelly Belly Factory Tour: In Fairfield, you can take a sweet candy-making tour to find out how they make those tasty little jelly beans. And if you exit through the gift shop, you can pick up some "belly flop" imperfect candies at a discount. Blue Homes: In Vallejo, you can see how an innovative home builder is taking construction into the factory to produce affordable, energy efficient houses using innovative techniques. Mrs. Grossman’s Sticker Factory: If you or your kids love stickers, stop into this Petaluma factory to learn more about how they're made. Reservations are required, and they charge a small admission fee. Heath Ceramics: The Sausalito dinnerware factory tour will show you how they make their famous plates, bowls, and other pieces. Make a reservation in advance and wear closed-toe shoes when you go. Children younger than age five are not allowed for safety reasons. In San Francisco, the focus is on ceramic tile. Dandelion Chocolate: This tour is just for you if you love chocolate and want to find out more about how it's produced. Tours happen once a day in the late afternoon and group size is limited. Reserve ahead. Guests must be at least eight years old, and they charge a small tour fee. Benicia Glass Studios: You'll find several well-known glass art studios in Benicia, including Lindsay, Nourot, and Smyers. Twice a year, they have open houses where you can watch glassblowers at work. Cowgirl Creamery: The renowned cheese maker offers tours and cheese tasting at their Point Reyes Station location. Firestone Walker Brewery: You can tour their brewery in Paso Robles for a small fee. Guests must be at least 12 years old and 21 years old to taste the samples. Everyone has to wear closed toe shoes. Intel Museum: Intel's Santa Clara headquarters has a museum that illustrates how they make computer chips, but they don't offer a tour of the factory itself. Sierra Nevada Brewing Company: In Chico, you can tour my favorite brewery, Sierra Nevada. They offer several tours a day, but it's best to reserve online because they fill up quickly. Visitors must be 21 or over to enjoy the beer tasting. Besides their general tour, they offer a Beer Geek tour that lasts 3 hours. Deering Banjo: Located in Spring Valley 10 miles east of San Diego. Their website says the banjo factory is happy to have you come for a tour, but it's a little short on details. Call or email if you want to visit. Check out the Guide of Things to Do in California to find more unusual and interesting places to go on your California vacation.